We just returned from the 2017 NRA Annual Meetings & Exhibits held in Atlanta, Georgia. This years show was filled with tons of new product announcements and releases. We connected with a bunch of really great people. 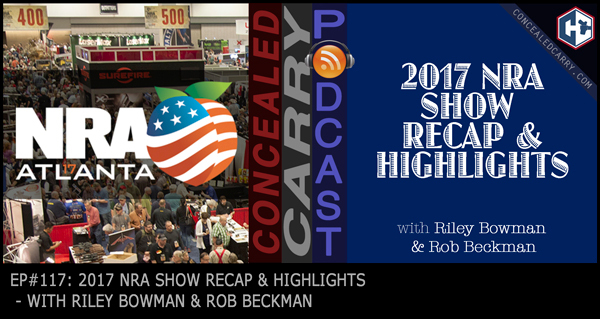 Today Riley and Cincinnati-based instructor, Rob Beckman, talk about the highlights from the show and which companies and products wowed them the most. There were some surprises along the way…oh, and we do make a little time to talk about a couple of interesting news stories plus one new JUSTIFIED story that teaches an important lesson. Listen in now! Sports Afield. After listening to these justified stories today on the podcast, have you ever considered how you would access your gun quickly in a home invasion while still keeping your firearms stored securely? The Sports Afield line of quick access handgun safes are perfect for the task. They are foam-lined yet built with heavy-duty 16 gauge steel that will keep your firearms protected and still allow you to quickly access them in an emergency with the reliable custom-programmable 4-button key pad. A line of full-size rifle safes are also now available that makes shipping and delivery easy! Trust this 100-yr-old brand (yes, the same company that has published the Sports Afield magazine since 1887) with your firearm storage and security needs. See the full line-up at: www.concealedcarry.com/sportsafield and for a limited time save 10% with the coupon code we mention in today's episode. Riley since you have FAILED to educate us with your best Root Beer quest in the last couple of awesome episodes of Concealed Carry Podcast. I’m here to remind you that you need to get back on track buddy. Here is a good resource and guide to follow Eric’s Gourmet Root Beer Site – http://www.gourmetrootbeer.com/index.html But instead of using barrels to categorize each root beer you can use a Bullet to represent a seal of approval root beer, sub-compact gun icon for drinkable root beer, a holster for not so good root beer, and FTF dummy round to represent garbage root beer. I can say that I was astonished at just how much Riley knows about root beer. I just got back from the NRAAM with him, and he got root beer to drink at dinner and proceeded to tell me that it tasted like 3 different kinds of root beer in one. That man knows his stuff!